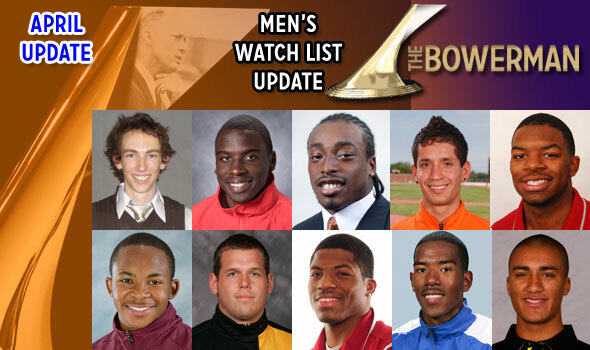 NEW ORLEANS – The U.S. Track & Field and Cross Country Coaches Association (USTFCCCA) announced on Wednesday the fourth update of the official watch list for The Bowerman as selected by The Bowerman Men’s Watch Committee. Florida’s Jeff Demps and Mississippi State’s Tavaris Tate are new additions to the ten names that comprise The Bowerman watch list. Demps, just a sophomore, clocked a world-leading 10.11 in winning the 100 meters at the Florida Relays last weekend. Tate, just a freshman, is the co-world leader in the 400, having posted a 44.86 in distance so far this season. During the indoor season, Demps won the NCAA Indoor title in the 60 while Tate won a world title as part of Team USA’s 4×400-meter relay team. This group of ten on The Bowerman Watch List is responsible for four world-leading marks, six American-leading marks, and eight collegiate-leading marks so far this outdoor season. The Bowerman Advisory Board appointed four of its members to comprise The Bowerman Men’s Watch Committee and another four of its members to make up The Bowerman Women’s Watch Committee. The committee will release its next update on Wednesday, May 5. The three men and three women finalists will be named on July 13. Award winners will be announced at the USTFCCCA Annual Convention, held December 13-16 in San Antonio, Texas. For more information on The Bowerman, the award, the recently-debuted trophy, and Bill Bowerman himself, visit TheBowerman.org. Keep up with Bowerman candidates on the USTFCCCA’s weekly results page (http://www.ustfccca.org/weekly-results) and by following the organization’s twitter feed twitter.com/TheBowerman. Jeshua Anderson JR Washington State Hurdles Woodland Hills, Calif.
Ronnie Ash JR Oklahoma Hurdles Raleigh, N.C.
Jeff Demps FR/SO Florida Sprints Winter Garden, Fla.
Ashton Eaton SR Oregon Combined Events Bend, Ore.
German Fernandez SO Oklahoma State Distance Riverbank, Calif.
Torrin Lawrence SO Georgia Sprints Jacksonville, Fla.
Tavaris Tate FR Mississippi State Sprints Starkville, Miss. Christian Taylor SO Florida Jumps Fayetteville, Ga.
Ryan Whiting SR Arizona State Throws Harrisburg, Pa.
Aaron Braun SR (ind.) Adams State Distance Fort Collins, Colo.
Charles Clark SR Florida State Sprints Virginia Beach, Va.
Will Claye SO Oklahoma Jumps Phoenix, Ariz.
Ricky Flynn SR Lynchburg Distance Gaithersburg, Va.
Walter Henning JR LSU Throws Kings Park, N.Y.
Trindon Holliday SR (ind.) LSU Sprints Zachary, La. Bryce Lamb FR Texas Tech Jumps Chandler, Ariz.
Curtis Mitchell JR Texas A&M Sprints Dayton Beach, Fla.
Scott Roth JR Washington Pole Vault Granite Bay, Calif.
Ramon Sparks JR Abilene Christian Jumps Kansas City, Mo. Delannie Spriggs SR Salisbury Sprints Owings, Md. Andrew Wheating SR Oregon Distance Norwich, Vt. OUTDOOR: Anderson kicked off his outdoor campaign by winning the Stanford Invite 400-meter hurdles in a season best 49.64, a time that’s No. 2 in the collegiate ranks this season … Anderson captured the Texas Relays title in the same event, running 49.77. INDOOR: Anderson notched a 46.38 indoor personal best over 400 meters in earning runner-up honors at the MSPF Championships, a mark that ranks No. 10 in the NCAA this season … Anderson, the 400-meter hurdle standout in the outdoor season, put together a solid 2010 indoor campaign and tallied a season best of 8.04 in the short-distance hurdles. 400mH Mar 26 49.64 1 SB Stanford Inv Palo Alto, Calif. OUTDOOR: Ash won the 110-meter hurdles at the Texas Relays in a wind-aided 13.50, the best time clocked by a collegian in all conditions this year. INDOOR: Ash captured his second-straight 60-meter hurdle NCAA crown this indoor season, joining Antwon Hicks of Mississippi (2004-05), Terrence Trammell of South Carolina (1999-2000), Tony Li of Washington State (1990-91, 55mH), Renaldo Nehemiah of Maryland (1978-79, 55mH), and Danny Smith of Florida State (1974-75, 55mH) as back-to-back high hurdle champs … Ash notched his personal best and collegiate-leading time of the season in the preliminary round of the NCAA Championships at 7.55 … Ash blazed a 7.59 in winning his first Big 12 Championship in Ames … Ash’s performance not only helped the Sooners to a Big 12 team title, but it also placed him among the all-time top 10 collegians in the event. OUTDOOR: Demps took the 100-meter dash title at the Florida Relays by running a world-leading time of 10.11 … also at the Florida Relays, Demps anchored the Gator 4×100-meter relay squad to an American- and collegiate-leading time of 38.93. INDOOR: Won the NCAA Indoor 60-meter title in 6.57 seconds and clocked 6.60 or better on three occasions during the season … his 6.56 in the preliminaries of the 60 meters was the fastest time by a collegian during the season … Demps placed second at the SEC Championships at 60 meters and was the winner of the Tyson Invitational 60. 60m Feb 5 6.64 1q/1h1 VaTech Elite Blacksburg, Va.
Feb 5 6.61 2 VaTech Elite Blacksburg, Va.
Feb 12 6.62 2q/1h9 Tyson Inv Fayetteville, Ark. Feb 12 6.59 1 Tyson Inv Fayetteville, Ark. Feb 27 6.62 2q/1h1 SEC Fayetteville, Ark. Feb 28 6.66 2 SEC Fayetteville, Ark. Mar 12 6.56 1q/1h1 CL, PB NCAA Fayetteville, Ark. Mar 13 6.57 1 NCAA Fayetteville, Ark. 100m Apr 2 10.11 w: 1.4 1 WL, AmL, CL , SB FloridaR Gainesville, Fla.
200m Mar 27 21.17 w: -1.4 4/1s2 SB UCF Inv Orlando, Fla.
4×100 Mar 27 39.37 anchor 1/1s1 UCF Inv Orlando, Fla.
Apr 3 38.93 anchor 1/1s1 AmL, CL FloridaR Gainesville, Fla. OUTDOOR: Eaton scored 8,310 points in his first decathlon of the season at the Texas Relays for a new personal best and the collegiate and American lead in the event. INDOOR: Eaton not only won the NCAA heptathlon title for the second-straight year, but he did it in world-record fashion … Scoring 6,499 points, Eaton reset what was Dan O’Brien’s 1993 record of 6,476 with five new personal bests over the seven-event bonanza … In January, Eaton topped what was Trey Hardee’s collegiate record with a 6,256 tally … Eaton would better each of his marks from that January weekend to claim the world record in March … Only a few hours after breaking the world record, Eaton returned to the NCAA meet to run the second leg of the Ducks 4×400 and helped the team to a sixth-place national finish … At the MPSF Championships in Seattle, Eaton claimed scoring positions in the pole vault (fourth) and as a member of the Ducks’ 4×400-meter relay team (second). OUTDOOR: Has yet to begin outdoor season. INDOOR: Fernandez clocked a 7:51.02 (OT) over 3000 meters at the Husky Invitational for the third-best time run among collegians this season … Fernandez qualified for the Big 12 final of the mile run, but was unable to finish … Fernandez did not participate at the NCAA Indoor Championships. 3000m Feb 13 7:51.02 OT 3 SB Husky Inv Seattle, Wash. OUTDOOR: Has yet to compete in his principle event, the 400 meters, yet this season. INDOOR: Lawrence had his dream indoor season conclude with his first NCAA title as he won the day with a 45.23 clocking over the 400-meter distance … Lawrence made headlines all season … The sophomore shocked the country with a 32.32, 300-meter race at the Hokie Invitational for an all-time collegiate best in late January … For an encore, Lawrence ran a collegiate-leading 45.03 at the Tyson Invitational over 400 meters to now rank No. 5 all-time in the world indoors and as the No. 3 collegian all time … Lawrence has also been responsible for splits of 45.00 and 45.04 for the Bulldog 4×400-meter relay team … Lawrence won the SEC 400m title in a meet record of 45.10 to become only the third person in history to run under 45.10 indoors twice (Michael Johnson, Danny Everett). 100m Mar 20 10.49 w: -0.4 1 PB at Ga. Tech Atlanta, Ga.
4×400 Mar 20 3:28.28 anchor 1 at Ga. Tech Atlanta, Ga. OUTDOOR: Ran to a collegiate-leading time of 13:25.63 in the 5000 meters to win the Stanford Invitational. INDOOR: McNeill won the NCAA title in the 5000 meters with a the collegiate-season’s best time of 13:36.41 in holding off Liberty’s Sam Chelanga … McNeill nearly also won the 3000-meter title, but was outkicked to the finish by Arkansas’ Dorian Ulrey … Earlier in the season, McNeill claimed two collegiate-leading marks in the distance events on back-to-back weekends … in mid-February, McNeill ran to a 7:47.52 (OT) win over 3000 meters at the Husky Classic in Seattle, marking the best time ever run by a collegian on an oversized track … the following weekend, McNeill claimed an altitude-hindered 14:17.92 clocking over 5000 meters for his second collegiate leader of the season (when converted to 13:39.32) … McNeill also picked up Big Sky titles in the 3000-meter run and the DMR during the indoor season. 5000m Mar 26 13:25.63 1 CL, PB Stan Inv Palo Alto, Calif. OUTDOOR: Opened the outdoor season with a blazing 44.86 one-lapper at the Alabama Relays for the shared-best mark in the world so far this year and the best by American or collegian for the 2010 outdoor season. INDOOR: Although just a newcomer to the collegiate ranks, Tate earned a world title as part of Team USA’s 4×400-meter relay team in Doha … Tate ran the third leg for the American squad in both the preliminary and final rounds at the IAAF World Indoor Championships to win world gold and help the U.S. to a world-best time of 3:03.40 … at the USATF Championships in Albuquerque, Tate finished fourth overall and ran the fastest qualifying time of 45.89. 400m Mar 27 44.86 1 AmL, CL, PB AlabamaR Tuscaloosa, Ala.
200m Feb 13 20.96 4/2h5 Tyson Inv Fayetteville, Ark. 400m Jan 16 46.49 OT 1/1s1 Kentucky Inv Lexington, Ky.
Feb 12 45.80 2/1s4 PB Tyson Inv Fayetteville, Ark. Feb 27 45.89A 1q/1h1 USATF Ind. Albuquerque, N.M.
Feb 28 46.24A 4/4s2 USATF Ind. Albuquerque, N.M. OUTDOOR: Hasn’t even competed in his known-for events yet this season, but is already part of a world-leading performance in the 4×400-meter relay … Taylor ran the third leg to help the Gators to a Florida Relays win and a time of 3:00.31. INDOOR: Taylor claimed his second-straight NCAA indoor triple jump title with an American- and collegiate-best for the 2010 indoor season of 56-4½ (17.18m) … Taylor’s best mark in the NCAA meet was preceded by his third-round performance that was just a half-inch shorter … Taylor also used a season’s best of 26-¼ (7.93m) in the long jump to place second nationally … In total, Taylor scored 18 team points for the Gators who went on to win their first NCAA indoor crown … Earlier in the season, Taylor won his second-straight SEC triple jump title and helped the Gators 4×400 to the conference crown. 400m Apr 2 45.55 1 SB FloridaR Gainesville, Fla.
4×400 Apr 3 3:00.31 3rd leg 1/1s1 WL, CL FloridaR Gainesville, Fla. OUTDOOR: The Sun Devil opened his 2010 season with a world-leader in the shot put at his home Arizona State Invitational, notching a mark of 69-8¾ (21.25m). INDOOR: Whiting won his third-consecutive NCAA indoor shot put title, becoming the first to grab three straight since UTEP’s Hans Hogland (1973-74-75) … Whiting matched his collegiate-leading season best with a 70-7¼ (21.52m) toss in the fourth round at the NCAA Championships and ultimately defeated his competition by over seven feet … Whiting finished the season No. 3 in the world standings and as the second-best performer in America … Whiting finished second at the USATF Indoor Championships in Albuquerque, earning him a berth on the IAAF Indoor World Championship team … Unfortunately, the world championship in Doha, Qatar, conflicted with the NCAA Indoor Championship. SP Mar 27 21.25m 69-8¾ 1 WL, AmL, CL, oPB AzSt Inv Tempe, Ariz.
DISC Mar 27 53.15m 174-4 3 SB AzSt Inv Tempe, Ariz.